Climate change can cause a slowdown in crop production in the next 20 years, says a new study. The chances of the slowdown—though small—are about 20 times higher than it would be without global warming. The authors, from Stanford University and the National Center for Atmospheric Research (NCAR), say climate change has substantially increased the prospect that crop production will fail to keep up with rising demand in the next 20 years. NCAR scientist Claudia Tebaldi and Stanford professor David Lobell used computer models of global climate, as well as data about weather and crops, to calculate the chances that climatic trends would have a negative effect on yields of corn and wheat in the next 20 years. The study says that while yields would continue to increase but “the slowdown would effectively cut the projected rate of increase by about half at the same time that demand is projected to grow sharply”. They found that the likelihood of natural climate shifts causing such a slowdown over the next 20 years is only 1 in 200. But with human-induced global warming, the odds jumped to 1 in 10 for corn and 1 in 20 for wheat. The researchers say organizations that are affected by international food availability and price may require plan differently to cope with the projected slowdown. The study appears in this month’s issue of Environmental Research Letters. We have a proverb we can convince a person who does not know and who knows well but not mediocre with half-knowledge. This is true with Stanford research findings. Earlier also they presented an article on Indian rainfall/monsoon. Now they are talking of production. Rainfall variations will influence on crop production but not temperature as they vary more in association with precipitation in the coming 20 years. MIT talks of ozone pollution on crop production -- the question is which ozone they are talking: ground level ozone or stratospheric ozone. Ground level ozone is more confined to urban areas. 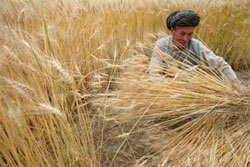 The impact will be negligible on crop production. So, there is no need to panic from such research from USA universities.